The Louisiana Now, is published on an as needed basis with news, opportunities and witnesses of the United Methodist churches in Louisiana. You can subscribe to the free weekly e-letter here. Below you will find magazine/newspaper archives. In the Winter 2016 edition of the magazine, read inspiring stories about churches serving in ministry with local and global communities in need! 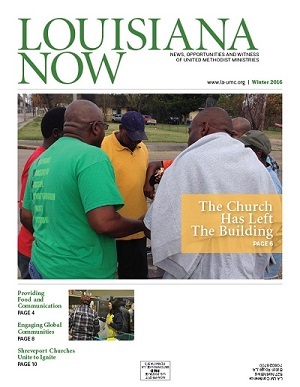 In this Fall 2015 edition of Louisiana Now, enjoy reading these inspiring ministry stories that embody the Mission and Core Values of the Louisiana Annual Conference! Step back 10 years to the summer of Katrina and Rita to remember where we were—and to celebrate where we are today in the Louisiana Annual Conference! Also, enjoy a recap and pictures from AC2015: Come and See, this year’s Annual Conference held June 7-10 at Centenary College in Shreveport, La. 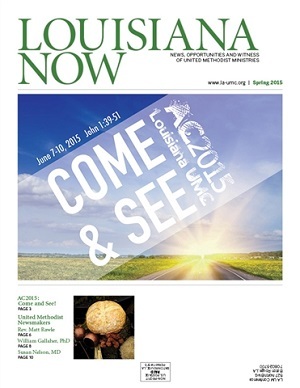 Enjoy the Spring 2015 edition of the Louisiana Now magazine, featuring highlights, guest speaker biographies, an agenda and “everything you need to know” about AC2015: Come and See, this year’s Annual Conference slated June 7-10 at Centenary College in Shreveport. Also, read more about United Methodist newsmakers, Rev. Matt Rawle, William Gallaher, PhD and Susan Nelson, MD. 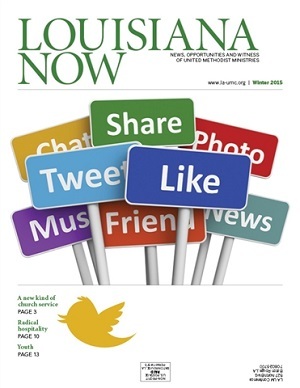 Social media and technology are the focus of the Winter 2015 issue of Louisiana Now. This Winter 2015 issue of Louisiana Now lifts up examples of how 21st-century technology is being effectively utilized by United Methodist churches throughout our conference. Also, you will find links to a wealth of resources that will help your church use technology effectively and enhance church ministry and outreach. Enjoy the Fall edition of the Louisiana Now magazine! Find out more about how local churches can engage schools and communities in innovative and life-changing ministry. 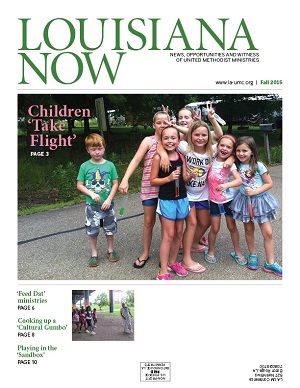 Enjoy the Summer edition of the Louisiana Now magazine! Find out more about General Conference 2016 and an upcoming preaching excellence plan . The Conference Communications Department has launched a new print publication! Replacing the monthly Louisiana Now! conference newspaper, this quarterly magazine—also entitled Louisiana Now!—is filled with interesting feature stories about cutting edge ministry in our own conference. Vibrant pictures and uplifting stories makes this new publication enjoyable to read—and should serve as the right complement to the weekly Conference e-letter. In the Dec. 20 edition of the Louisiana Now! First United Methodist Church of Baker and Bethel UMC of Greenwell Springs prove that smaller churches can have “big” outreach through community feeding and childhood development programs. The New Church on Louisiana Avenue in Lafayette, pastored by Rev. Robert Johnson, brings renewed life to a declining church after four short months. The conference office of Congregational Development and Transformation is helping to make sweeping, conference-wide changes through vital programs and strategic planning with church leaders in each of our six districts. Find out what a tearful teenage boy taught Sarah Thebarge (cancer survivor and author) about Advent. See snapshots from the conference-wide “Prepare for the Child” initiative. • View job postings for NOLA Wesley Foundation campus minister and youth/student director for Trinity UMC in Ruston. Enjoy the Nov. 22 edition of the Louisiana Now! in which you will find a feature on the history of Weekend of the Cross, a four-day mission event spreading through the Louisiana Conference; highlights of the ministry of Southern University’s Wesley Foundation; Louisiana Volunteers in Mission opportunities for 2014-2015; opportunites for laity to serve and General/Jurisdictional Conference delegates AND as Lay Servant Ministers; and a reminder to churches to take offerings for UMCOR’s typhoon response, and to lift up World AIDS Day, Sunday, Dec. 1. Find interesting stories on Peace with Justice grant winners, Wesley Foundation students now serving in youth ministry, and Local church outreach efforts! In the Sept. 20 edition of the Louisiana Now!, find features about GRACE Camp (for children of incarcerated persons); national and local participation in the 50th anniversary of the March on Washington; coping with the transition to college life; feeding the homeless of New Orleans through St. Mark’s UMC; coming PrimeTimers events sponsored by GBGM; and conference-wide events equipping United Methodists for service and ministry. A story of interesting coincidence . . . On June 4, the first candidate--a woman--ordained by Louisiana's first woman bishop was mentored by the first woman ordained in the Louisiana Conference! Sarah Luginbill is back at Grace Community UMC after six months of serving as the UMVIM team coordinator in Haiti. Read her story. Congolese doctors serving in HIV/AIDS clinics recently toured the Louisiana Conference sharing information about their work. Information about Youth Ignite, Louisiana Volunteers in Mission and the work of the Episcopal Residence Committee. Campus ministry is a vibrant and critical component of the mission of the Louisiana Annual Conference of The United Methodist Church. Find out more about what is happening with mission and ministry on 11 college campuses throughout the state in this special edition of the Louisiana Now!. Diane Reich, LAVIM Advisory Committee, explains the evolving structure of Louisiana Volunteers in Mission in the wake of the elimination of the Conference LAVIM office. Reports from LAVIM volunteers to India, Cambodia, Cuba and the Bahamas discuss the work that has been done . . . and the work yet to be done in those countries. A complete update from Willie Berman, Mexico VIM director, gives conference volunteers an overview of the exciting work taking place to better the lives of Mexico’s citizens . . . and gives ways we can play a role in this vital work! Hear from McNeese Wesley Foundation volunteers who spent their spring break working for Bahamas Methodist Habitat . . . and McNeese nursing students who provided medical services in Rio Bravo, Mexico this winter. Read about valuable resources and training provided by United Methodist Volunteers in Mission in a column written by Debbie Vest, South Central Jurisdiction UMVIM director. Find out more about Primetimers (educational and mission service experiences for older adults) and Individual Volunteers (a way to serve beyond the mission team). Read about an ongoing local mission in New Orleans which provides meals to the city’s homeless citizens. Learn more on how to host a global missionary at your local church! Information about the 2013 Louisiana Annual Conference slated June 2-5 at Centenary College in Shreveport. Learn more about the agenda, speakers, worship services, special offerings, meeting schedules, meals, amendments and more! News about appointments made at the District and Conference levels for the 2013-14 conference year. A story about the conference senior high retreat, held March 1-3. Celebrations for Bishop Cynthia Fierro Harvey, who recently received the Wiley College Women of Excellence Award . . . and her upcoming role as a featured speaker for Exploration 2013, to be held Nov. 15-17. Information on the Christian Community Development Conference coming to New Orleans Sept. 11-14. Reports about the ongoing work of the church in Haiti---and from the United Methodist-sponsored Relevance X 2013 leadership conference which focused on young adults. A helpful article on “Three Simple Rules” to train church leaders and volunteers! 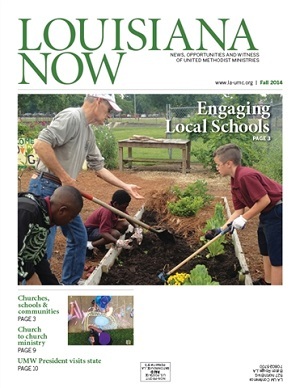 Enjoy this special edition of the Louisiana Now! featuring Dillard University, a New Orleans based United Methodist institution of learning. Peace With Justice grant winners in the Louisiana Conference—Asbury UMC in Bossier City, First Grace Community Alliance in New Orleans and Bethany UMC, also of New Orleans. The new Connectional Table, a governing body of The United Methodist Church. As a member of the table, Pete Aguila, a member of University UMC in Baton Rouge, serves as chair of the Finance and Budget Review Group for the General Church. The “Intercept Human Trafficking Campaign” sponsored by United Methodist Women, including a report on conference involvement and a commentary by Bishop Cynthia Fierro Harvey. Creative outreach programs sponsored by First UMC in Shreveport, Noel UMC in Shreveport and Olla UMC. Find out how to sign up for these conference-sponsored Coming Events! The 2013 African American Summit, to be held Feb. 24-25 at The Wesley Center in Woodworth. Tending Our Lives Together VIII, a clergy retreat slated for Feb. 25-26 at The Wesley Center. Early Response Team Training, scheduled for March 9 at Trinity UMC in Ruston. The 2013 Clergy Spouse Retreat, Feb. 22-23 at The Wesley Center. · Operation Happy New Year, a community outreach sponsored by First UMC, Covington that serves 500+ meals to those in need. · An ongoing food distribution mission sponsored by St. Mark UMC, Alexandria. · The latest information on new and revitalized congregations in our conference from the Office of Congregational Development and Transformation. · Scholarship opportunities for college-bound United Methodist students! · America’s Sunday Supper, offering United Methodist churches a model for community discussions and outreach to military families. · News and projects of Louisiana Conference United Methodist Women. · The district realignment process currently taking place in the Louisiana Annual Conference. In the Dec. 7 edition of the Louisiana Now! , find stories and opportunities of exciting missions through the Louisiana Volunteers in Mission ministry! • Coverage of the Service of Installation of Bishop Cynthia Fierro Harvey held Oct. 20 at First UMC in Baton Rouge. • A feature on Rev. Randy Nichols, an elder in the Louisiana Annual Conference, serving extension ministry as director of the Capital Area Alliance for the Homeless. • Information on Hurricane Sandy and Bishop Cynthia Harvey’s call to local churches to set aside Nov. 11 as a day to take a special offering to help with the response. • A call for Disaster Response Teams serving Louisiana in the wake of Hurricane Isaac. • Updates on the 2013 Louisiana Skeeter Run slated for March 2, 2013. Save The Date! • Coverage of the conference-wide Junior High Retreat held Oct. 26-28 in Woodworth, La. • Photos from two recently held leadership conferences--Leading Beyond the Walls, held Oct. 26-27 in Alexandria, and L.E.A.D. 2012, held Nov. 2-3. • A one-page insert featuring United Methodist Women! • Information of Making Our Lives Hospitable to the Holy, a seminar sponsored by Centenary College and led by Enuma Okoro, slated for Dec. 3! · Leading Beyond the Walls, slated for Oct. 26-27 in Alexandria, La. · L.E.A.D. 2012, Catch and Release, slated for Nov. 2-3 at The Wesley Center in Woodworth, La. · Information on the LA 5-Day Academy for Spiritual Formation slated Jan. 6-11, 2013 at The Wesley Center in Woodworth, La. · Details on Leading Beyond the Walls to be held Oct. 26-27 in Alexandria, La. · Effective Church Stewardship and Fund Raising, slated for Sept. 15 in Metairie, La. · Successful Church Mergers . . . and More!, set for Sept. 16 in New Orleans, La. · Women Performing for Women 2012, benefitting Hagar’s House, slated for Sept. 27 at First Grace UMC in New Orleans, La. · Leading Beyond the Walls, set for Oct. 26-27 in Alexandria, La. · L.E.A.D. 2012, to be held Nov. 2-3 at The Wesley Center in Woodworth, La. · News regarding the election and assignment of Bishop Cynthia Fierro Harvey as Episcopal leader for the Louisiana Annual Conference! · Additional news from the South Central Jurisdictional Conference, including the involuntary retirement of Bishop W. Earl Bledsoe of North Texas and the merger of two separate conference areas. · A feature about ongoing work in India with medical and construction teams. · The latest information about mission in Mexico. · How Early Response Teams are helping tornado and flood stricken areas throughout the United States. · A full listing of mission opportunities for 2012 and 2013 offered through LAVIM! The April 20 edition of the Louisiana Now! is dedicated to Christian Education! · What’s new for the future for Christian formation? · Everything you need to know about the 2012 Louisiana Annual Conference to be held June 3-6 at Centenary College in Shreveport. · Information about progress made through Imagine No Malaria, and a reminder that there is still time to register for the Louisiana Skeeter Run! · A story about clergy children from the segregation era in Louisiana reunited at a Connectional Table meeting. · How your church can help with the conference response to areas of Louisiana deeply affected by recent storms and flooding. · The announcement of Rev. Hadley R. Edwards as the New Orleans District Superintendent starting in July. · Information on the May 19 Early Response Training. · Helpful information from Dr. Lovett Weems on how churches can become fruitful congregations. 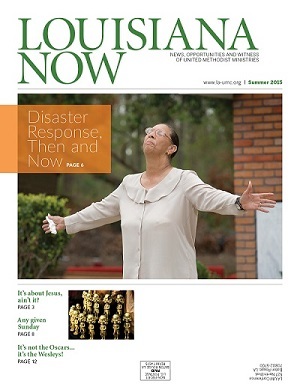 Enjoy this special edition of the Louisiana Now! which features the academic program and student life of Dillard University in New Orleans, Louisiana, a United Methodist institution. Local churches throughout the Conference involved in exciting programs and outreach efforts changing the lives of those living in poverty in Louisiana. Conference plans to host 5K Runs and half-mile Fun Walks on April 21, 2012 in benefit the Imagine No Malaria initiative of The United Methodist Church. Louisiana’s United Methodist Women and the many outreach efforts they support locally and globally. The Nov. 12 L.E.A.D. Conference, featuring Bishop Gregory Palmer and other well-known leaders who provided local churches with insight on excellence in evangelism, worship leadership, church administration and discipleship. Local church pastors, administrative assistants and webservants . . . please post a link to this paper on your church website, email the document to your members and visitors, or email the link to the paper to your members and visitors. We want to share the Louisiana Now! with every United Methodist in our conference! Your help is essential and much appreciated! Information about the Louisiana conference-wide 5K/Mile Walks slated for April 21, 2012 benefitting Imagine No Malaria (next year’s Change the World project)! And exciting stories about ministry from our local churches throughout the Louisiana Conference! · A UMNS report on how Louisiana and other United Methodist conferences were affected by Tropical Storm Lee.